SAN DIEGO (AP) Ross Stripling got past the San Diego Padres despite not having his best stuff and now can look forward to his first All-Star Game. Stripling said it’ll be more important if the Dodgers are still in first place on Sunday. Ross (5-8) took a one-hit shutout into the seventh before it fell apart. Chris Taylor doubled with one out and manager Andy Green came out to check on the big right-hander. Green let Ross stay in, but he allowed Toles’ single on his 101st pitch and was pulled. ”Sometimes you execute and they get enough of it, and that’s what happened tonight,” Ross said. San Diego’s Wil Myers hit a two-run double off Scott Alexander with two outs in the seventh. 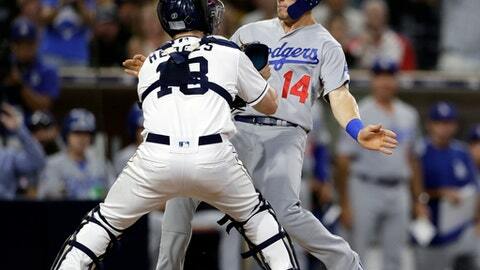 The runs were charged to Daniel Hudson, who walked Austin Hedges leading off the inning and then allowed a single to pinch-hitter Franmil Reyes before making way for Alexander. Dodgers: RHP Walker Buehler (4-2, 3.44 ERA) is scheduled to start the opener of the second round of the Freeway Series against the Angels at Dodger Stadium on Friday night. It’ll be his first start since being placed on the 10-day DL with right ribcage soreness on June 29. The Angels will go with Felix Pena (1-0, 3.63).